Married in 1874, Sam and Emma Wilcox moved to Grove Farm where Sam assisted his brother with cattle operations and served as Sheriff of Kauai for twenty-five years. Emma managed the house and the early education of their children, and her housekeeping schedules continue to be followed today. Advance reservations are required for the unhurried two-hour guided tours of the buildings, gardens and grounds at Grove Farm museum. Tours are given in small groups, (which fill up quickly! 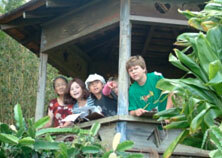 ), and are led by Kauai residents who know the sugar plantation history and about life on the island. *** If you enjoy sharing wonderful stories and meeting people from both the local community and around the world, becoming a Volunteer Guide at Grove Farm museum may be right for you. Guides are asked to tour about twice a month, but we are happy to work with your schedule! Monday, Wednesday, and Thursday, starting at 10:00 a.m. and 1:00 p.m.
To make reservations or for more information, please telephone (808) 245-3202 or email tours@grovefarm.org. An email reply will be sent to let you know if the tour time you requested is available. If you are interested in a last minute tour, it is highly recommended that you telephone. There is a requested donation of $20.00 for adults and $10.00 for children 5 to 12 years. Tours are not given on most holidays and may be cancelled on rainy days. Because of the popularity of these tours, once a reservation has been made, if you need to cancel please call (808) 245-3202 as soon as possible. Grove Farm is located on the western edge of Lihue, the central island community, on Nawiliwili Road between the Kukui Grove Shopping Center and Nawiliwili Harbor. Look for the GROVE FARM sign on the left side of Nawiliwili Road as you travel toward the harbor. As you turn off Nawiliwili Road into the Grove Farm entrance, the TO PARKING sign is immediately on your left, just over the old railroad tracks which lead you onto a gravel road to our parking lot. After parking and locking your car, walk to the path cut into the grass hedge which will lead you to the Grove Farm front lawn. Please check in at the old Grove Farm office, which is the first building on your right. In Hanalei, the 1836 Waioli Mission House built by the Reverend W.P. Alexander, was home for missionary teachers Abner and Lucy Wilcox and their seven sons. 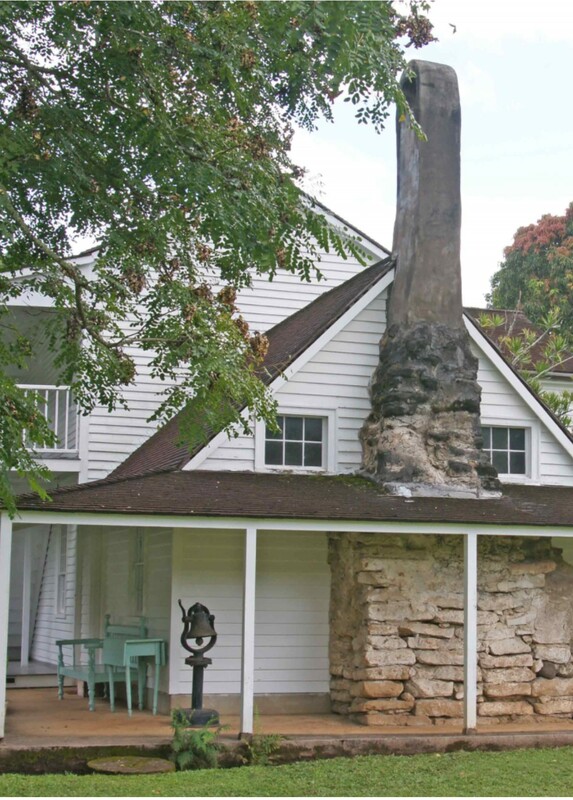 For 50 years after Abner and Lucy’s deaths in 1869, the old mission home sat empty until it was restored in 1921 by their granddaughters Etta, Elsie and Mabel Wilcox. 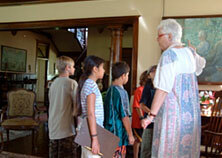 The mission house today continues as a quiet touchstone to the missionary efforts on Kauai. 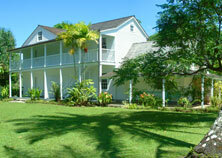 Tuesday, Thursday and Saturday between 9:00 a.m. and 3:00 p.m.
No reservations are required at the Waioli Mission House. There is a requested donation of $10.00 for adults and $5.00 for children 5 to 12 years. The Waioli Mission House is located behind the small green Waioli Hui’ia Church north of Hanalei town. 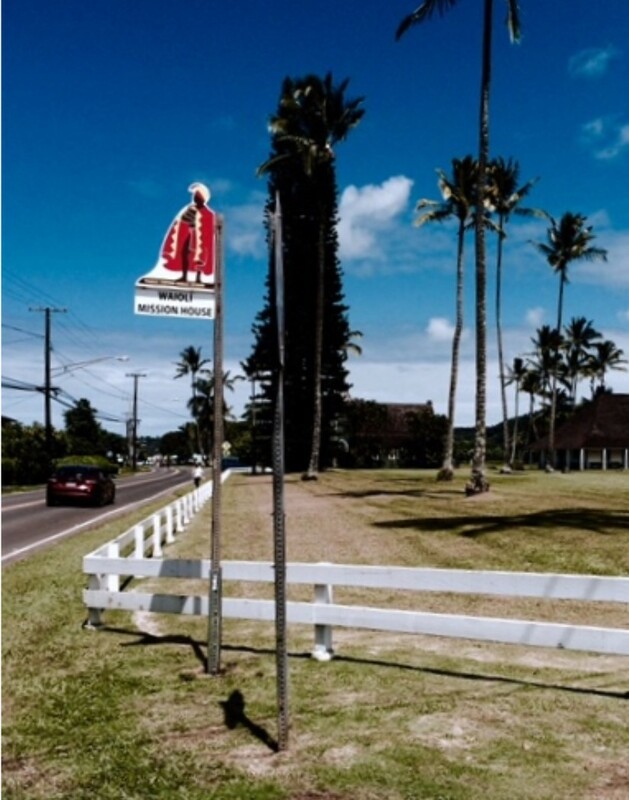 Turn at the Kauai Visitors Bureau sign on the corner of the long drive that runs between the small white fence on the church property and the chain link fence on the Hanalei School property. Drive down four telephone poles and look for the small ‘parking’ sign with an arrow on your left. As you walk out of the parking lot there will be a white picket fence on your right. Go through the gate and up to the chimney. Ring the bell and a guide will come out to meet you. There are no self guided tours. We invite you and your students to take part in the educational opportunities that abound at Grove Farm and Waioli Mission House museums. Available for school tours and other educational groups are the historic grounds, buildings, and the collections contained within, as well as an historic photo collection, oral histories of former plantation workers, ledgers of plantation workers and their pay scales, collection of Hawaiiana artifacts, and much more. Also, a ride on a restored sugar train along an authentic locomotive right-of-way can be arranged. We can assist you and your students in meeting the curriculum requirements that relate to benchmarks in the core content areas of English, language arts, mathematics, science and social studies. The extended core content areas of career and technical education (incorporating career and lifestyle skills), education technology and fine arts are also possibilities. Contact the Tour Coordinator at (808) 245-3202 or email at tours@grovefarm.org with any questions you may have, or to make reservations for you and your students to visit. Reservations are taken on a space available basis and should be scheduled at least four weeks in advance.